Sell your products based on dynamic area rather than fixed pricing. 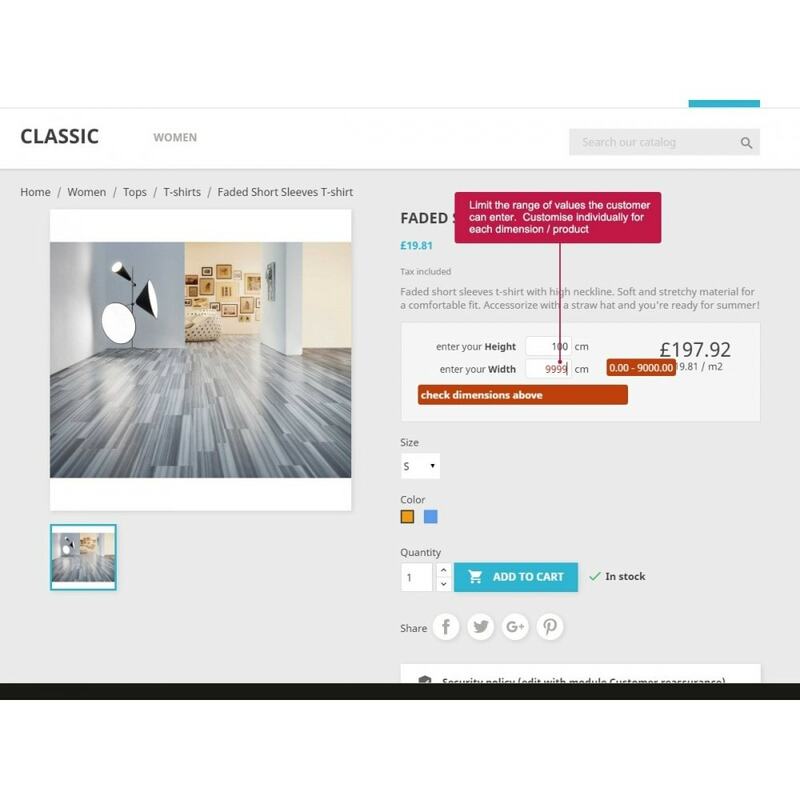 A great feature for merchants selling products which are cut to size such as carpets, flooring, wood, glazing, glass and more. Allow your customers to enter the area and the dynamic price automatically calculated live. 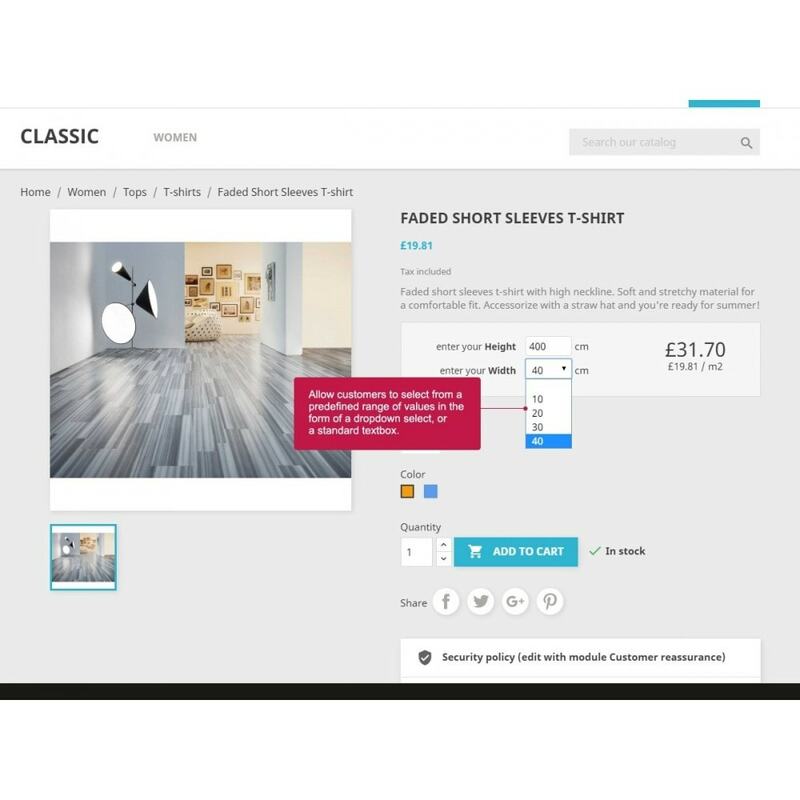 Additional features include setting up specific prices for different area ranges, a useful feature to allow you to adjust the cost of your product depending on the total area of the product being ordered. Allow customers to enter sizes / area either into text boxes or select from a predefined list of values. The module also has the option to calculate product weight dynamically based on dimensions entered by the customer, a powerful feature which allows dynamic weight based shipping to be applied to the dynamically sized products . If you're looking for a powerful solution to sell products with dynamic pricing based on customer input, then the variety of powerful and unmatched features in this module will be the ideal solution for you. Add custom dimensions units such as width and height options to individual products and dynamically calculate product price based on the values the customer enters for these dimension fields. 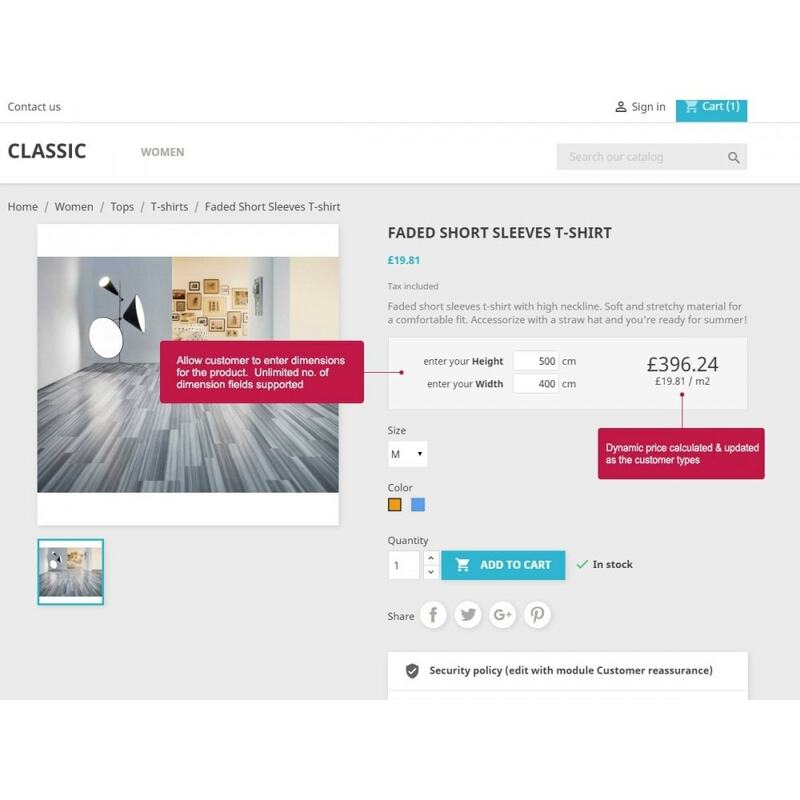 Sell products which require a dynamic price to be calculated based on dimensions such as width and height. This module allows you to set up and display different dimensions, and calculates single, square meter, cubic meter or even more calculations. Price calculations can also include combination / attribute prices. The module also allows you to create your own advanced calculations using the simple to use built in Equation Editor. A powerful and flexible module ideal for merchants selling carpets, flooring, windows, glass, plastic sheets, murals, curtains or any product which is sold in square meters or merchants wishing to sell product priced by area or area ranges. Price is updated live as the user enters area values or changes the options. Works with product attributes and product attributes prices. Set up prices based on total area ordered by customer, useful for adjusting the cost depending on how much the user orders. Limit the extension to only the products you need the feature for. Full, easy to manage translations within the module configuration. No need to edit any language files. Powerful equation editor allows you to create more complex equations for calculating the dynamic prices of your products. What's more, you can create unique equations for each of your product combinations. Custom equations even support the use of conditions for conditional values in your equation! Create and assign a unlimited number of dimension fields to your products. Display dimension inputs as textbox or a list of fully customisable dropdown values. Define a min / max value the customer can enter for each of the dimension fields individually. 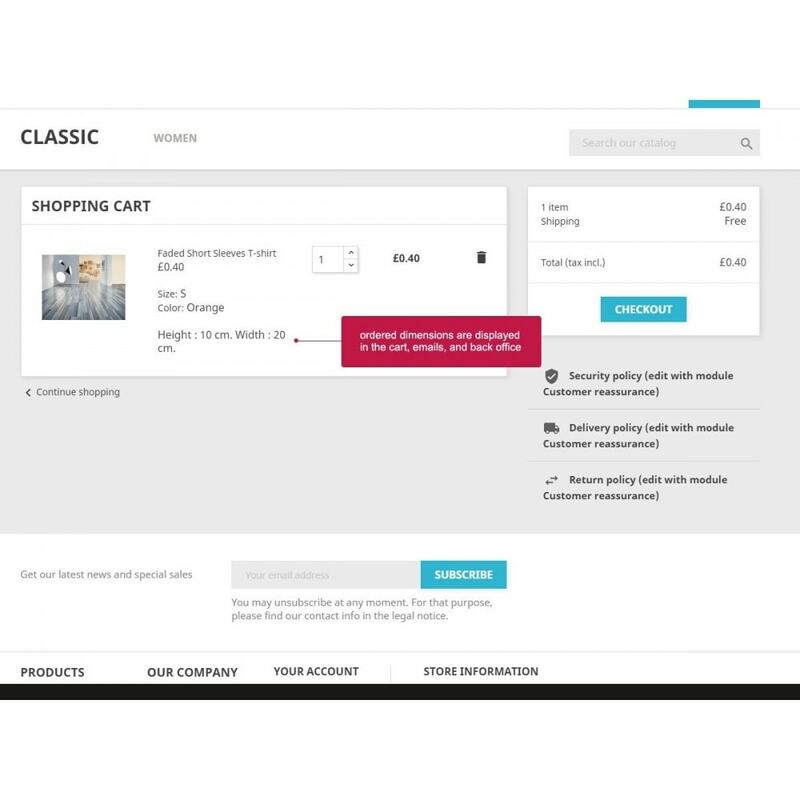 Allow your customers to order products which are made to measure based on the measurements customer enters at the product page and calculate dynamic product prices accordingly The measurements are displayed in their basket, checkout and order emails and invoices for later reference. Upload module file to your modules folder and install module from the back office.